During the exhibition ‘Life of Buddha’ De Nieuwe Kerk organises various lectures, some in co-operation with the KVVAK. You don’t need to register: free entrance with your KVVAK membership card. Dr. Ching-Ling Wang (Curator of Chinese Art, Rijksmuseum Amsterdam) previously worked as curator of pre-modern Chinese art at Museum für Asiatische Kunst, also being in charge of the Chinese collection of Ethnologisches Museum, both Staatliche Museen zu Berlin – Preußischer Kulturbesitz. From 2012 to 2013 he was research fellow of “Connecting Art Histories in the Museum”, a joint research and fellowship program of the Kunsthistorisches Institut in Florenz, Marx-Planck-Institut and the Staatliche Museen zu Berlin. His research interests focus mainly on Chinese literati painting, Ming and Qing court art and questions concerning visual, material, cultural and artistic exchanges between China and Europe in the 17th and 18th centuries. 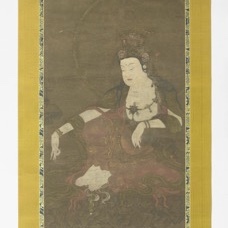 In the collection of the Rijksmuseum is a Buddhist painting depicting the deity Water-Moon Avalokiteśvara sitting on a rock in the pose of royal-ease (san. maharajalilasana) being worshipped by the boy-pilgrim Sudhana. This lecture aims to serve as a fundamental research through examining the iconography and style of this painting in detail. Firstly, Wang will reconstruct the reception history of the painting. Secondly, a detailed iconographic and stylistic analysis will be presented in order to date and identify the painting. Wang argues, this painting is a late fourteenth century Japanese hybrid creation that combines both Chinese iconography and style of Ningpo Buddhist painting of the Song and Yuan Dynasties, as well as decoration elements of the Korean Goryeo Buddhist painting. In light of the recent researches on the interregional connection of East Asian Buddhist image production, the Rijksmuseum Water-Moon Avalokiteśvara provides an example of the interactions between China, Korea and Japan in the fourteenth century.